Well, now that 2010 is here it is time to start working my temple calendar for 2011. Not sure if I'll change anything from the one I already made for 2010. 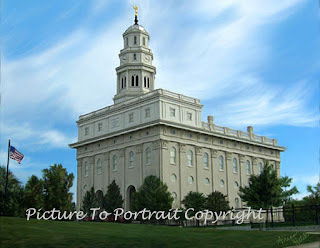 However, I have had a couple people ask for an international temple calendar. I am thinking that I may start collecting temple pictures from those who have visited or actually live in foreign countries and have a good picture or two of their temple. My name is Arian Hatch, the artist behind Picture to Portrait. I live in Arizona with my husband and five kids. I love to take a playful snapshot or a simple pose from a photographer and watch as it turns into something so much more. Seeing the faces come to life as I paint makes me feel a connection to each and every painting. Feel free to browse the tabs to see more examples of my work. Let me know if you have any questions.